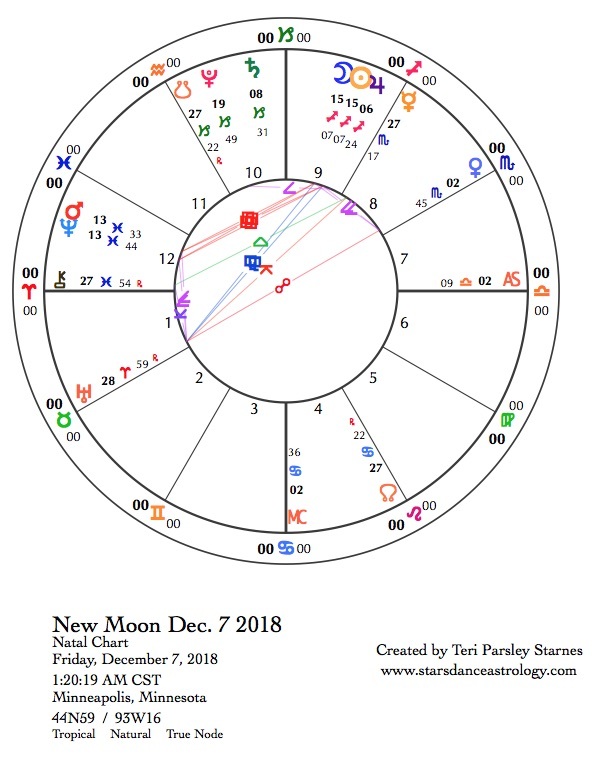 December 7, 2018—New Moon: Seeding. Hope is a problem. Hope is part of our national myth. Hope is one way white Americans bypass responsibility. Hope is a way to place our attention on a magical future and detach from being present. Hope is escape. Yet hope can be more. Hope is a source of energy that helps us recommit to work, justice, love. It helps us dream of new possibilities. At this new Moon seeded in the mutable fire sign, Sagittarius, I wonder if it is possible to somehow occupy the liminal space between blind hope and blinding despair. Can I find the right kind of hope to fuel my life? A lot of hopes get pinned on Sagittarius and its ruler, Jupiter. Jupiter is supposed to bring luck. Sagittarius enthusiastically scans the horizon for meaning. It’s a fire sign! Sometimes, that is enough to generate hope. Energy equals hope, right? In the book, World as Lover, World as Self, Macy writes about the inescapable experience of loss, as we face environmental degradation and dying. The Earth is suffering. People are suffering, too. She says, rather than try to stay hopeful, we need express our despair to be fully present to the world as lover and beloved. We must break the spell of fantastical hope, which is only a deep fear of grief, to be free to hope that our lives can matter. Can we matter to the Earth? Can we change the way we are in this relationship? Macy’s experience is that when we tell the truth about our despair, a hope awakens. If we dare to feel our grief, we find more energy to continue our work in this world. This new Moon is an opportunity to re-pattern hope, to break the spell of hopefulness. Grief is a river that flows through our souls collecting the pains and losses we’ve suffered. Each of our rivers is different. Some are at flood stage. Some are momentarily peaceful. Rivers change. Our relationship with grief changes too. It is important to let the river be what it is. Grief is doing the work it needs to do and takes as long as it takes. 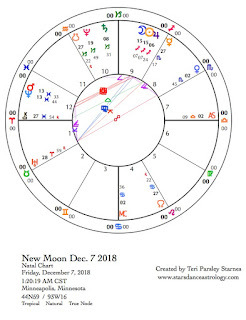 At this new Moon, Mars and Neptune exactly conjoin in Pisces. This transit is a directive to feel what we feel. Mars can find the missing piece, the boon, the reason we dare to act through passion. Mars asks us to trust our emotions. Neptune can bring release and connection. We get to put down the smaller concerns of our egos to merge with universal experiences of love. The way into hope is through despair. This energy is potent. The Moon and Sun in Sagittarius are square to Mars and Neptune. Squares are challenges that bring new awarenesses and tools. The challenge is to keep sight of hope while letting hope transform into responsible action. Sagittarius is a fire sign, and we have many things to do. This new Moon carries a larger significance since Jupiter just entered Sagittarius for the next year. Jupiter also happens to co-rule Pisces (with Neptune taking the role of modern ruler). Where do we receive our truths? What is the connection between truth and hope? Real truth. Real hope. We’ve had an extended experience of death recently, with Jupiter’s transit through Scorpio last year, and through retrogrades—both Venus and Mercury have traversed the Scorpio landscape this way. Scorpio’s mission is to see with clear eyes what most of us want to avoid. Death is here. Our strategies of denial have weakened. At this new Moon, we may be able to reap a new relationship with death. Each new Moon we plant seeds of intention. The seeds are a spell. May this spell create discernment between the hope that heals and the hope that conceals. May we break the spell of despair with truth’s willingness to speak. May we harness the fire of action to change our relationships with the Earth. So it has been spoken…. Contact Teri at teri@starsdanceastrology.com and visit their website at www.starsdanceastrology.com to book a reading of your chart. Follow the Starsdance Astrology page on Facebook to receive these forecasts daily and learn of other offers and events.